Healthy wetlands are an integral component of healthy watersheds and provide many essential ecosystem services. As defined by the EPA, a watershed is the land area that drains to one stream, lake or river, affects the water quality in the water body that it surrounds. Individual watersheds share similarities but also differ in many ways. Every inch of the United States is part of a watershed – in other words, all land drains into a lake, river, stream or other water body and directly affects its quality. Because we all live on the land, we all live in a watershed — thus watershed condition is important to everyone. Increasingly efforts to protect, restore, enhance and create wetlands are being employed to improve overall watershed health and to support climate change adaptation. 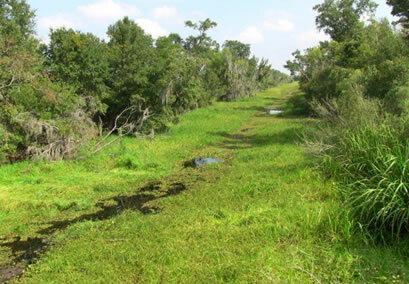 Both traditional and innovative wetland protection and restoration projects - including hybrid systems using green infrastructure – are being increasingly employed to provide critical ecosystem services and benefits, such as increased flood and drought protection, clean drinking water, and habitat. In 2019, ASWM completed a two-year project, entitled Healthy Wetlands, Healthy Watersheds to help states and tribes build their capacity around integration efforts that leverage state wetland restoration and protection programs to improve watershed health. The products of this project are listed below under ASWM Resources for States and Tribes and include a white paper, state program integration case studies, watershed project integration case studies, and other support resources. Considerations for Measuring Integration Value (ASWM, 2019) – Coming Soon!